Liquid Crystal Polymer Market size was over USD 375 million in 2016 and consumption should exceed 65 kilo tons by 2024. Shift of preference in consumer trends towards miniaturization of electronic components which include connectors and surface mount device should drive global liquid crystal polymer market size. LCP has wide application scope in electronic components which includes personal computers and mobiles characterized by its lightweight, durability, high performance and efficiency influencing product demand. 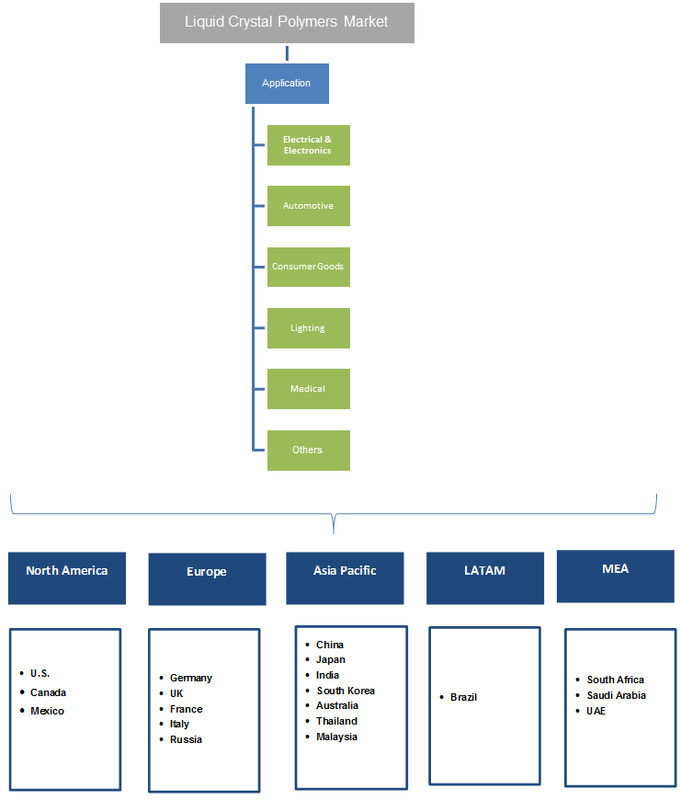 Asia Pacific electrical & electronics market size, led by China, Japan, India and South Korea, witnessed steady growth and surpassed USD 2.5 trillion in 2015 owing to strong technological innovations and new product development initiations undertaken by industry players. Due to excellent flow properties improving moldability along with outstanding mechanical properties at high temperatures, inherent flame retardancy, excellent chemical resistance and good weatherability should propel liquid crystal polymers market size. 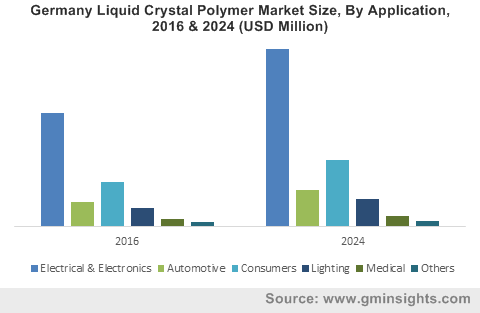 Technological innovations along with widening application scope automotive, packaging and electronics industries should drive liquid crystal polymer market demand. This growth in liquid crystal polymer demand can be attributed to environment-friendliness, low maintenance cost, enhanced performance characteristics such as low coefficient of thermal expansion, minimal moisture absorption, high strength of modulus, abrasion resistance and flexibility. LCP’s are widely used as a substitute to polyamide films in packaging industry owing to its exceptional chemical & mechanical properties. LCP’s are also favored over other materials including EVOH films because its low maintenance cost and lower viscosity over a longer production run. Benzoic acid and p-hydroxy naphthoic acid are key raw materials used in LCP synthesis process. LCP films & laminates are produced from thermoplastic LCP resins in the form of granules and pellets. Global market supply constraints due to limited bi-phenol manufacturers can create a supply demand gap and affect liquid crystal polymer market price. Liquid crystal polymer market size from electrical & electronic applications should witness gains at over 6% during forecast timeframe. This growth in product demand can be attributed to growing automation and consumer inclination towards ultra-compact electronic parts, equipment and devices. U.S. smartphone sales surpassed 190 million units generating revenue over USD 55 billion in 2016 complimenting growth in LCP demand. Liquid crystal polymers market size from automotive applications should generate revenues surpassing USD 80 million by 2024. Germany automobiles sales in 2016 surpassed 3.7 million units compared to that of 3.5 million in 2015 growing at a rate of 5.7% annually. Rising automotive sales and production rate along with consumer preference of high end-electronic devices in car interiors should drive liquid crystal polymer (LCP) market demand. Liquid crystal polymer market size from medical application should grow significantly during the projected timeframe. Recent upsurge in medical device industry focusing on microelectronics and biotechnology along with rising numbers of medical device & equipment manufacturers should propel LCP product demand. R&D spending in U.S. medical device industry averages at over 6% of their total revenue, adopting LCP in medical devices owing to lowered production cost. Europe liquid crystal polymer market size led by Germany, UK and France is projected to grow at over 4.5% during forecast period owing to strong regional automotive industry. Presence of major automotive OEM’s along with consumer inclination towards high-end automobiles should bolster product demand. Recent advancements in vehicular electronic devices complimenting compact design and impact resistance should have positive LCP demand outlook. China liquid crystal polymers market size should witness significant gains at over 7% by 2024. China also boasts to be leading regional market accounting for a major share of total market share in 2016 in Asia Pacific. This demand growth can be attributed to rapid expansion of electronics & electrical industry. Increasing industrial machinery application substituting ceramic materials and mass transfer packaging in chemical industries should complement industry growth. U.S. liquid crystal polymer market size will have strong gains during forecast period owing to shifting trends of adopting lightweight, durable and high-performance materials in medical industry. Increasing research spending on new product development harnessing exceptional traits like mechanical strength, heat tolerance and chemical inertness should bolster regional industry growth. Global liquid crystal polymers market share is moderately concentrated with industry players including Celenese, Solvay, Sumitomo, Polyplastics Co., Toray International, Kuraray and RTP Co. These industry participants focus on strengthening their production capacity along with expanding their distribution network and regional presence. Companies adopt various strategies like mergers, acquisition and partnerships to gain technological know-how along with expanding liquid crystal polymer market portfolio. Liquid crystal polymers are a class of crystalline aromatic polyesters based upon p-hydroxybenzoic acid and other monomers which are extremely inert and unreactive. It can be produced by dissolving a polymer in solvent or by heating a polymer above its melting point. These products are fire & chemical resistant and have a highly crystalline molecular chain in comparison to other common polymers like ABS and nylon. They exhibit a semi rigid, stacked orientation of linear molecules. LCP’s have melt temperature range of 2800C to 3300C and mold temperature range of 700C to 1300C.